To celebrate the first day of June, today I’m letting you in on my favorite way to beat the heat: Raspberry Peach Iced Tea Lemonade. Bold black tea + classic lemonade + and fruity kick that sweetens this drink to pure perfection. FACT: Never underestimate the refreshing, feel good powers of an ice cold drink in the sweet Summer heat. 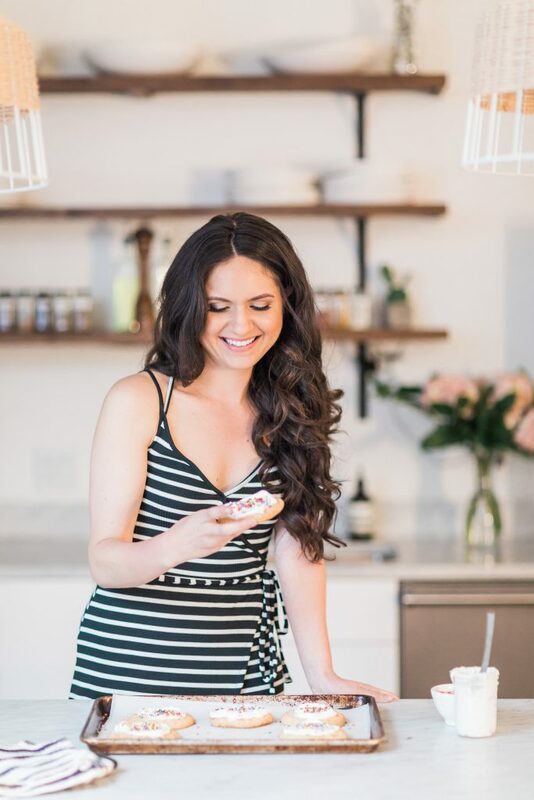 Today’s recipe is all about sitting back, kicking up your feet (even if it’s just for a minute! ), and sipping your way into a glorious state of Summertime relaxation. You… me… ALL OF US – We need these moments. And with this easy recipe, we can have them day after day after day. <—– YES WE CAN; yes we will. So let’s jump into the fresh and fruity details! Raspberry and peach time, baby. 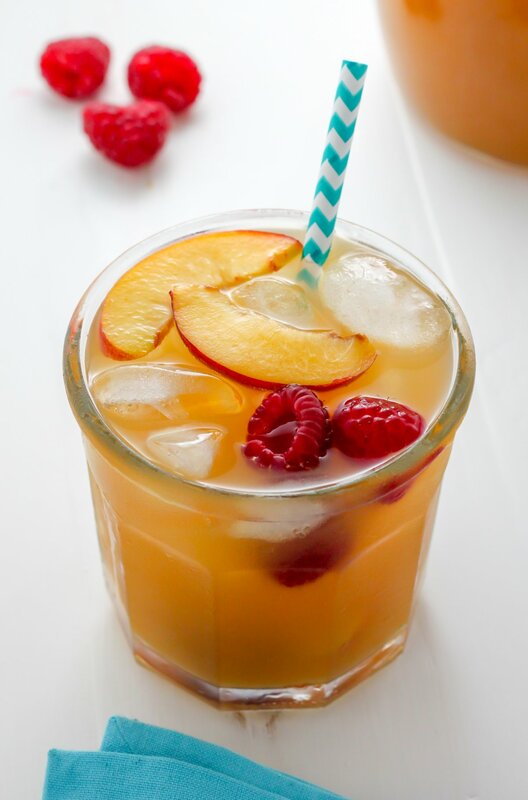 For the raspberry peach nectar you’ll need 2 cups of fresh raspberries, a pound of sweet ripe peaches, a stock pot, and water. Once you’ve procured these ingredients you’ll boil a good amount of water in a stock pot and submerge the peaches. You’ll keep the peaches in the water until the skin becomes soft and begin to loosen. At this point you’ll remove the peaches from the boiling water and place them into an ice bath (a really big bowl of freezing cold ice water) to stop the cooking process. Once they’re cool, you’ll simply peel the peaches, remove the pit and cut them into slices. When you’re ready to make your raspberry peach puree, simply combine the sliced peaches, the fresh raspberries, and 1 cup of water in a blender, then pulse until smooth. The last step of this process is the straining! 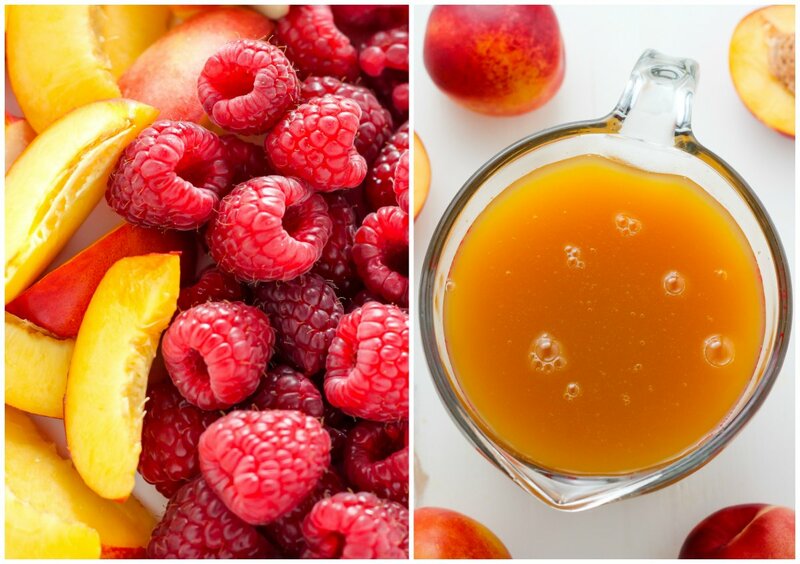 For a silky smooth puree you’ll strain the liquefied raspberry/peach mixture through a sieve. And that’s it! 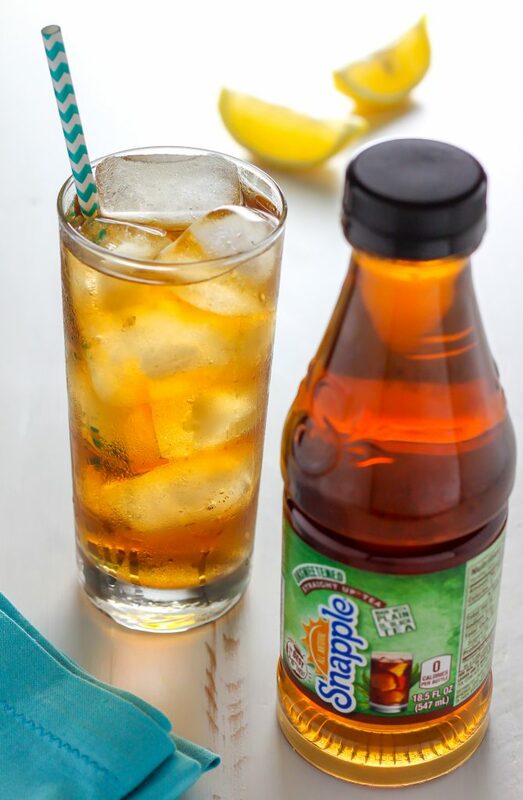 For our iced tea we’re using Snapple® Unsweetened Straight Up™ Tea , baby! I’ve teamed up with the good folks over at Snapple® to bring you this post, and I couldn’t be more excited about their delicious black brewed tea. It’s bright, refreshing, and perfect as the base for this sweet and fruity recipe. Truth: I’ve been drinking Snapple since I was in middle school and they never cease to amaze me with their wonderful products. P.S. Did you know Free Tea Day is June 10th?! Snapple is offering a complimentary coupon for a FREE 16 oz. Snapple glass or 18.5 oz. Straight Up Tea over at SipYourSummer.com. This coupon is available on June 10th ONLY and it’s redeemable exclusively at Walmart – while supplies last. Can’t make free tea day? Not to worry! 18.5 oz Straight Up Tea and Premium Glass items will be on Rollback for $1.00 in-store at Walmart starting on June 3rd. WIN. And while you’re there, check out the new, limited time only Lady LiberTEA, which comes in single bottles and in 6-pack form. Lady LiberTEA contains a blend of delicious black tea with RED raspberry, WHITE peach and BLUEberry flavors. It’s fruity, delicious, and available in stores between May 1st through July 4th – Get it while it lasts! The lemonade part of this drink couldn’t be easier. Simply squeeze a bowl of lemons until you have 1 whole cup of fresh lemon juice. That’s it! Once you’ve done this final step, you’ll combine the iced tea, lemonade, and puree together in a large bowl or pitcher, mix well, and pour. For a pretty presentation I like to serve this drink with extra fruit and colorful paper straws. Pretty and easy! 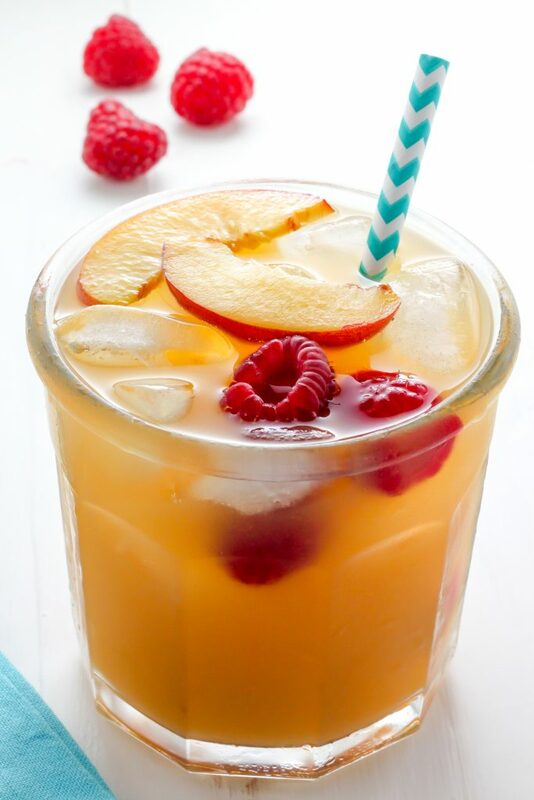 Sweet peach puree, red raspberries, black tea, and fresh squeezed lemonade all mixed up in one cold, cool, and utterly refreshing Summertime beverage. Bring 3-4 cups of water to boil in a medium-sized stock pot or sauce pan (you want enough water to be able to easily submerge the peaches). Once boiling, carefully dip each peach into the water and leave them there until the skin becomes soft and begins to loosen from the flesh. Using a slotted spoon remove from the peaches from the boiling water and place them in a large bowl of ice cold water; this will stop the cooking process. Once cool to the touch, peel the peaches, remove the pit and cut into slices. Using a citrus juicer or manual squeeze tool juice lemons until you have one full cup of juice. 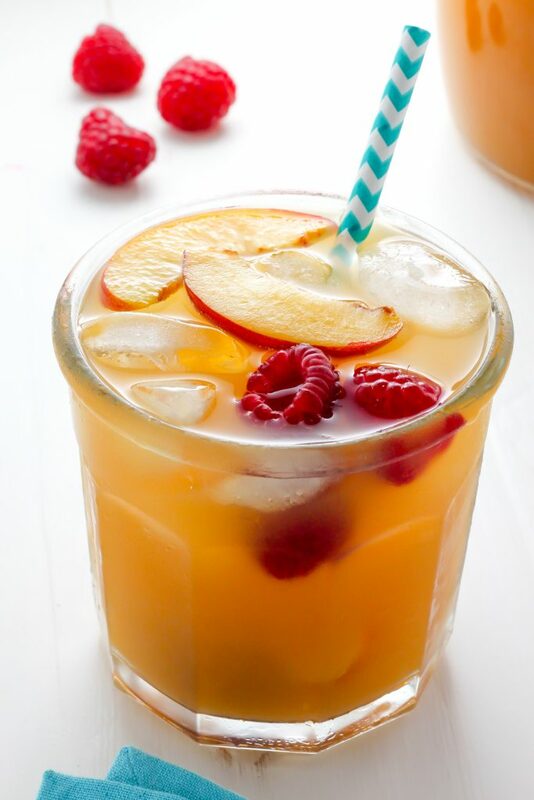 Pour this juice into a large pitcher. Stir in the sugar, if using. In a large pitcher or punch bowl combine the iced tea, lemonade, and nectar. Stir well to combine, and taste. 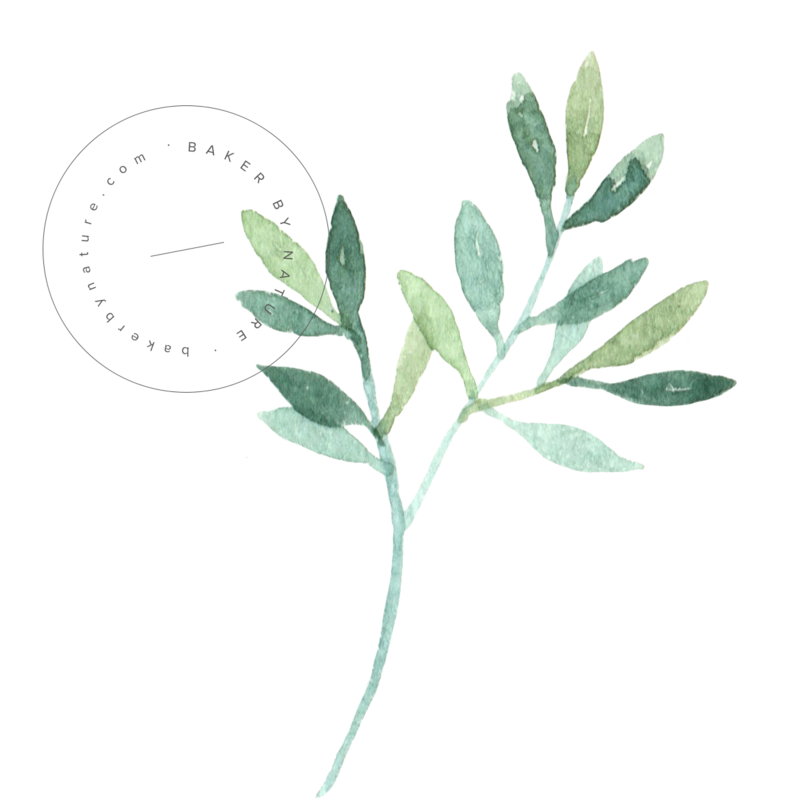 If the taste is too sweet, add more lemon juice; if the taste is too tart, add more nectar. 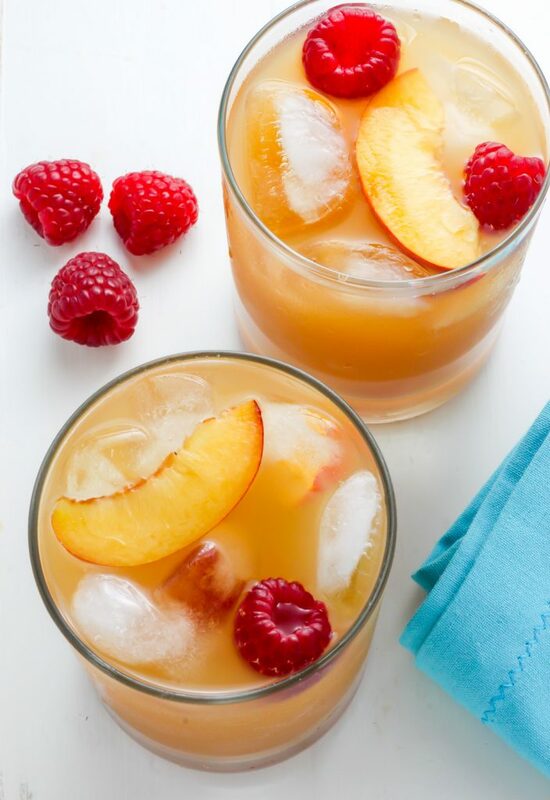 Pour into glasses with ice and garnish with extra raspberries and peach slices. Looks like such a delicious, refreshing summer drink!! Raspberries + peach must be really refreshing! It definitely is 😉 Thank you, Medeja! This Iced tea sounds so refreshing and perfect for a hot summer day! This drink looks delicious. Perfect summery treat! 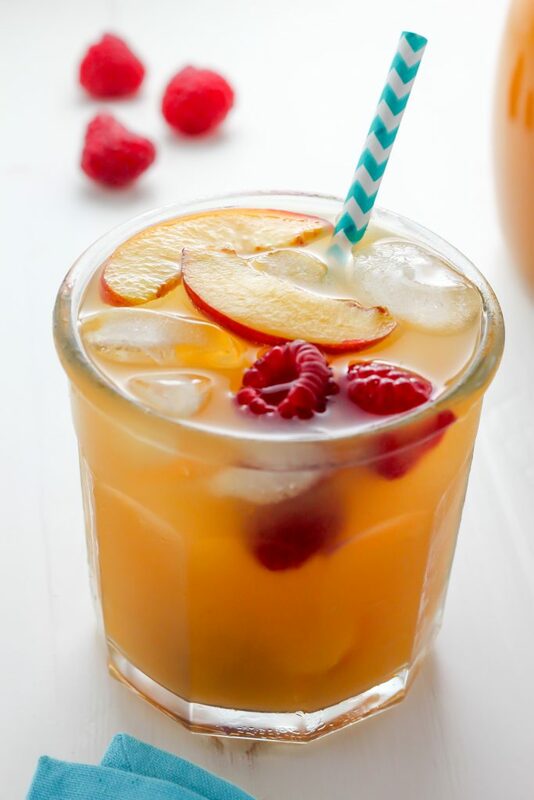 This looks delicious – I love adding fresh fruit to my tea for extra sweetness! Thanks Millie. Fresh Summer fruit is the BEST! This sounds so YUMMY!!! I think my readers will love it! Can’t wait to link it to my post in a couple weeks!